Atención! Click the sidebar poll to register your view on my effort in writing A Nightmare on Elm Street 2: Freddy’s Return. A neighbour once told me how he felt about his missus while he was courting her: he would have killed for her. Now 25 years later he doesn’t care if she lives or dies. Beauty does not last forever. Talent may not last that long either. Usain Bolt is the fastest man alive. He may never beat his 100metres personal best of 9.58seconds – mankind may never – but if he wants to he had best be quick about it. The superman quality – the sporting prowess – is fleeting. An artist’s timeline is harder to measure. John Lennon and Michael Jackson peaked before they died. Oasis had three good albums in them before they descended into self-parody. Yet Jay-Z’s most recent album is his 11th studio effort and he continues to soar. John Grisham’s debut novel A Time to Kill was a gripping legal thriller. He rewrites it every year under a different title. Even Shakespeare pilfered himself. Yet Thomas Harris progresses as a storyteller with each successive novel. In Hollywood Alfred Hitchcock was not the filmmaker of his former self before he died. John Carpenter, Martin Scorcese, Spike Lee, Oliver Stone – as sacred as cattle can be – have not made a movie this century to match their former glory. Scorcese and Lee especially remain technically adroit alas the magic is gone. Yet James Cameron and Clint Eastwood continue to successfully challenge convention. 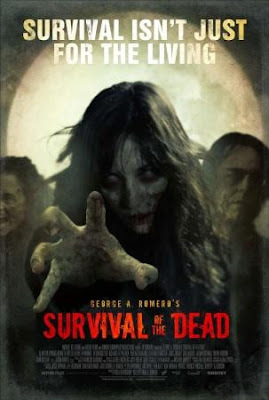 Survival of the Dead 2010 is the bookend of the second zombie trilogy. The first trilogy is the best in horror and one of the best in all of film. 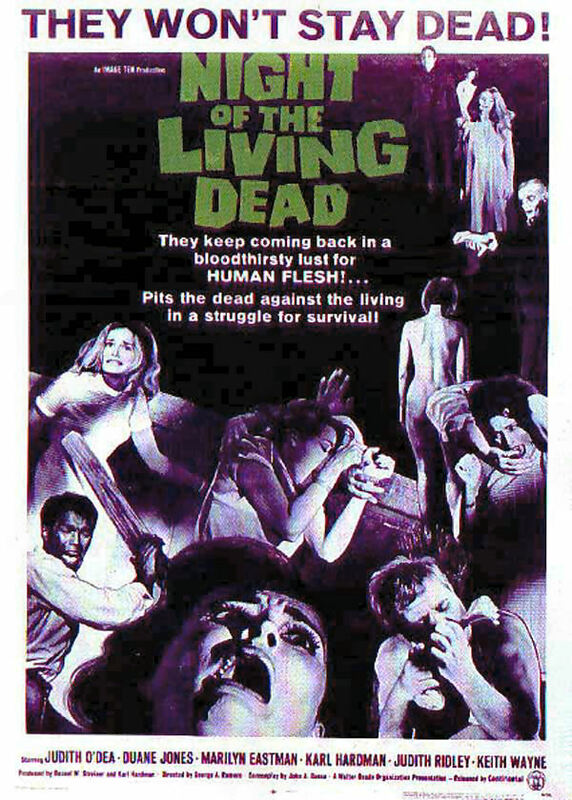 The Trilogy of the Dead began in 1968. It is nigh impossible to appreciate the impact Night of the Living Dead had on those who saw it in that most tumultuous of years. The ugliness of the low budget does not impinge its power. Some of the audience – John Carpenter, Tobe Hooper, John Landis – share their awe in the documentary The American Nightmare 2000. I urge all to watch it. 40 years on and Night of the Living Dead continues its relevance: on 18th May the Thai army conducted the red shirt massacre. I am reminded of Dawn of the Dead 1978 every time I go to my local Walmart. This is where the people gather and wander. They fill their trolleys with foodstuffs that are saturated with fats and sugar and salt to induce addiction then they go home and gorge. They grow heavier and unhealthier and so they feed their children. They are the epicentre of the obesity epidemic. They don’t know when to stop. Dawn of the Dead is one of the top 10 horror films of all time. It is a work of genius. The third entry in the trilogy cannot compare to the first two. Any film that uses the evil military as backdrop loses a sense of subtlety. That is not to say the military is not a legitimate target of the dramatist however in Day of the Dead 1985 there is also the spectre of the mad scientist: A Dr Mengele type experiments on zombies thus foreshadowing the gene techno terror of the 21st century whilst in the tradition of The Island of Dr Moreau. Day of the Dead is effective as drama but not so as satire. The evil military and the mad scientist plotlines cancel each other out. However the premise of a world overrun by zombies and the increasing aptitude of the undead were the foundation for the next trilogy. 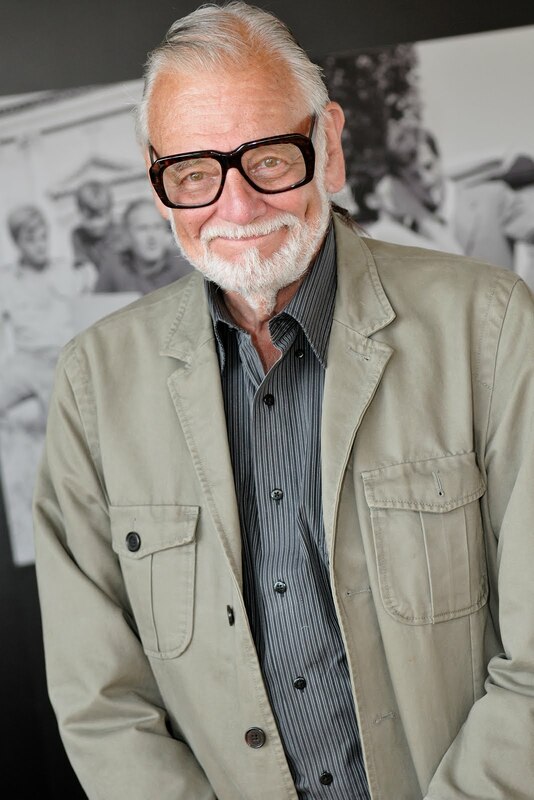 The release of Night of the Living Dead exalted George A Romero as horrormiester. By the conclusion of the trilogy in 1985 he had also directed The Crazies 1973 Martin 1978 and Creepshow 1982. He was the horror tsar. Trilogy of the Dead became home video legend and over the next 20 years it became lore. The rumours began of a new Romero zombie film – of a new trilogy of films. It was apropos. There were so many copycats. The Trilogy itself was being remade. In 2002 Danny Boyle reinvented the genre with 28 Days Later. It was time. The rumours were true. The Horror Folk had forgotten that Oasis only had three good albums in them. 2005 marked the end of the second trilogy of the Star Wars franchise. Though the scifi fans were grateful for the crumbs overall it was disappointing. 2005 also marked the start of the second trilogy of the dead. 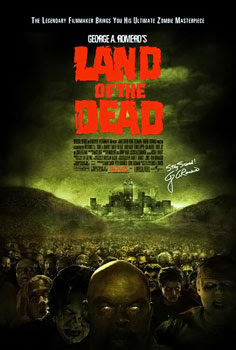 At $15million Land of the Dead is the (joint) biggest budget Romero film to date. The mythos of the Trilogy afforded him bigger names (though no A-listers): Dennis Hopper, John Leguizamo, and his mate’s nipper Asia Argento. In the Romero tradition of social commentary the story circled a city fenced off from the zombie hordes. The well-to-do lived in ivory towers whilst the poor existed on ground squalor like cockroaches. The police were a death squad for hire enforcing the order of the rich. As salivating as the set up sounds none of the threads were developed. Instead the film focussed on a vanilla hero who pined to drive off into the sunset - and a Good German zombie. Big Daddy is so cognisant it is almost impossible to view him as undead. Furthermore the zombies are given attributes – fear of water, mesmerised by fireworks – which they overcome. A feature film is too short a story form to introduce new laws only to break them. There are good ideas that don’t work (Pontypool 2009). Land ignored its good ideas and focussed on the bad. Romero wrote the script. With this movie he wrote off his crossover appeal. With his next movie Diary of the Dead 2008 he filmed zombies sans horror – and wrote off his fan base. As a result Survival of the Dead 2010 is low budget with no major studio distribution and no name actors. The franchise has revolved full circle though it had more life in 1968. This is the first film that references another in the series and indeed is the first narrative sequel. Alan van Sprang starred as Brubaker in Land. He played the colonel in Diary and that (renamed) character is the lead in Survival. The prologue establishes the world is overrun by zombies and Sarge takes his unit AWOL; they are the bandidos of Diary. The story shifts to Plum Island off the coast of Delaware where the townsfolk speak Oirish. Amidst the spreading infected are two warring factions. O’Flynn is introduced as a warlord full of righteous bloodlust. Muldoon is precision killer who believes their zombie kin can be saved. It’s not hawks vs doves it’s hawks vs vultures. Muldoon outnumbers O’Flynn. He banishes him off the island. O’Flynn returns with the bandidos. 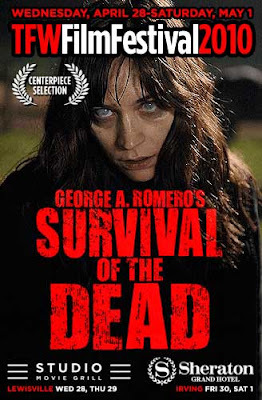 The joy of a Romero directed zombie flick is the subtext. The dismay of Survival is that there is none. Sarge and his unit don’t represent nor stand for anything other than self preservation which is particularly moot in a zombie film. The token female warrior is a stock spicy Latina Vasquez rip-off. Boy is ripped off from the character Jesse Eisenberg played in Zombieland 2009. It’s as if Romero decided to infuse humour - for the first time – in order to appease the market. Yet the series continuity is skewed; a soldier looks on in disbelief as Boy steals from a corpse – forgetting that he’s a land pirate from the previous film. O’Flynn is an old coot. He’s on a killing spree but as Sarge admits he’s likeable. Muldoon is not. His stance on the zombies is intractable even if he dooms the whole island in his hope filled delusion. He believes the zombies can be taught. He tries to feed one pig. Hence Muldoon and subsequently the whole movie is problematic because this was the role of the mad scientist in Day of the Dead. Romero is pilfering himself. The most hackneyed cinematic devices are the amnesiac and the identical twin. This film doesn’t have an amnesiac but Jane the twin has the worst dialogue of a Romero penned character. Other than that her actions are ludicrous. It’s another potential parody point for Wes Craven. There is one moment of Romero in this flick. Sarge comes across some good ol’ boys that spiked the decapitated heads of a number of African-American zombies for some ‘fun’. In the 40 years since the first film the definition of ‘fun’ hasn’t changed – for some. The best performances come from Kenneth Welsh and Richard Fitzpatrick. The old men pretend they’re pioneers from the old country who have brought their old ways with them but without the Fenian slurs. However the rest of the film’s tone is uneven. Romero’s attempt at humour fails. Slapstick does not fit in the theme. It’s a theme flawed by recycling – like toilet paper. When Danny Boyle released 28 Days Later there was an immediate question of the validity of Romero’s zombies. Was their lumbering relevant in a digital century? Zombieland proved that they were albeit in a different format. Further the best Romero-esque zombie film since 1978 was Zombies of Mass Destruction 2009. A new generation has taken ownership of his creation and the tsar is redundant in a republic. Romero says there are two more instalments planned. If they do come to fruition they’ll be released straight to DVD. The Horrormeister may well have film left in him but not zombies. Survival does not conclude the second trilogy because there is no second trilogy. The last three films have been ramshackle and behind the curve. Though the lumbering zombie will continue into the 21st century with the likes of Zone of the Dead 2 they will do so without direction from Romero. One man can only do so much and talent may not last forever but Romero’s legacy will. Night of the Living Dead and Dawn of the Dead are seared into folklore. Unfortunately Land was the dead too far. 2010 marked the 6th film of the franchise. 2011 will mark the start of the second trilogy of Scream. George A Romero is an inspiration and despite my disappointment with Survival of the Dead I look forward to watching his future work. A Nightmare on Elm Street: What about the sequel?